In Japanese, the word for “four” sounds like the word for “death.” I don’t know what this would mean, but I think it has to do with 4 & 4, which equals 44. Narrative: “cLATTER” “agAINST” = Latter Saint/ as in Mormon Tabernacle Choir Church of the Latter Day Saints-notoious for their performance of Handel’s Messiah/Hallelujah Chorus. The bone tree has been pecked through by “woodpeckers”. We have 2 “bushel baskets”. In dry weight, a bushel = 4 pecks…2 bushel baskets with 4 pecks each = Door 44. The bushel baskets have “HANDLES, the doors have “HANDLES”, the rakes have “HANDLES”. We have MelancHOLY & strANGELy. Narrative “sudden GUST Of wind” The Hallelujah chorus of HANDEL’s Messiah is sung with GUSTO by the HOLY ANGLES. Narrative: “gray clouds” “dead” “bones”. Think cremation & death masks. The handle/poles of the rakes suggest pole vaulting over the wall. We can now consider VAULT, TOMB, CRYPT, OSSUARY (a place where bones, metal from the body is kept after cremation). The finials atop the door crowns look like cameras. Under each door number is a perpetual flame-that’s not hair blowing over the “death masks” that represent whoever is interred in that particular vault. 4 pecks per bushel ans two bushels works for me as a 4,4. And there certainly is a dead theme here. “Dead” or “Death” would be a key word here. And I remember that rake is skewing the tree, like it killed it and there is some room connection stuff there, but probably just red herring stuff, not guide stuff. Fantastic! While there are 1, 2, and 4 peck bushel baskets, (1 is probably the most common) a bushel as a unit of measurement is 4 pecks and these are very big baskets… maybe big enough to hold 4 pecks… I buy it! I need to make an image to show you, but there are 44 limbs connected to the top of the picture. If you try to count you’re likely to get 43 or 46 or 45 or something like that, but you have to be very deliberate about which limbs are actually pictured connecting to the top of the picture; some come very close but then bend behind another branch. Holy cow! Really? I’ll have to find my magnifying glass and check it out. Instead of an 8 in the tree trunk (Carl’s idea) how about an infinity symbol. 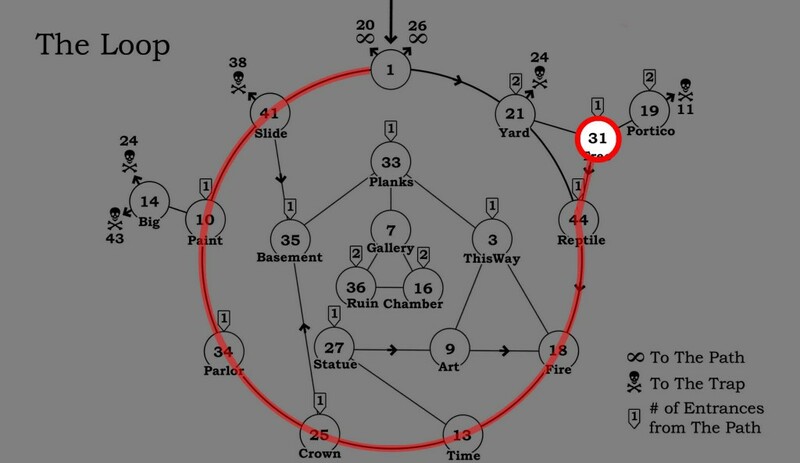 Maybe this is a hidden image of the 16 step path? I see no reason to take it this way, I am just chucking it out there to see if someone else can run with it. The dead leaves at the base of the tree (“Dead leaves began to gather at our feet.”) trail off in the direction of 44, a bit. Actually, that trail is pretty good. There’s a weaker “trail” going toward 21…maybe. Post-17, I wonder if White Raven thinks the two bits of branch to the left on the ground are forming a rough line directing us toward 44. Hey, I better phrase that with more confidence. The two bits of branch to the left on the ground are forming a rough line directing us toward 44!! I doubt it, WR put up that 17 stuff just as food for thought. I heard this is the page of the week. The term “doors look very strange” can also be they look “odd”. The guide corrects this. So, the correct door is an even number, not odd. Then they “push open one of the heavy doors “. The opposite would be a light door. 44 has the most light, the others are darker. The guide says “I corrected” them. Why? Because they were ‘not right.’ Thus, the door on the right is incorrect. All of the three choices are ‘branching’ off the path. But, there could be a ‘loophole’ (as the hole in the tree). In the text ,the number 2 is very prominent. (“too”) and there are sixteen doubles. The answer then is 16 divided by 2 = 8. 8 is the correct number, being the unmarked door. If you came from 8, by all means “leave”. Feel free to discuss these four points on the pod. I like your observation that door #44 is the most brightly lit, but — Well, okay, let me try to buy into the logic here. Because my own reading of “one of the heavy doors” is “one of the doors, all of which were heavy”. (As if it were “one of the wooden doors”.) So on that reading, they’re all heavy doors. But let’s try your reasoning instead where the “heavy” doors are only 19, 21, and the unmarked one if you like, whereas the “lighter” door is 44, the most illuminated. Why should the reader be expected to understand that “we managed to push open one of the heavy doors” is a clue AWAY from the “heavy doors” and toward the “lighter door”? Why should the reader be expected not to take it as a clue FOR those doors? More generally, are we always going to interpret the “visitors’ choice” as wrong or are we always going to interpret it as right? What we certainly can’t do is be inconsistent. Then again, I don’t know how much stock White Raven sets by those exit lines. I can think of two I’ve thought were good clues, that he’s never supported: “Full of confidence now they marched out to…” in room 2 (where both “safe” exits show marching figures overhead, and the “unsafe” exit shows stationary figures overhead), and Mr. Gentile’s well-known “Turning around…” clue in room 14 (which gives the correct exit as being the only possible entrance, 10). So maybe we shouldn’t set much store by those exit lines at all. But if you’re going to say that “one of the heavy doors” should clue us AWAY from 19 and 21 here then you’d better be prepared to extend that logic to other rooms. Room 31 is planned to be the focus of a Halloween episode on October 31. This Friday, Barry and I plan to discuss Room 43. Solutions welcome! I like to see your solutions that stray away from the double-letter coding, for reasons amply discussed. I like the “odd” proposal, its clean, the rest though… nah. vewatkings, how about numerology? I’m amazing at it in case you didn’t notice already. These solutions are creative but I don’t think there is anything here. The basic approach being used is flawed, a string of connections with no reasons. 3. Odd (as in strange) is switched to the numerical definition. 4. “Odd” is applied to the numbering of the doors. 5. Odd is switched for even on account of the guide’s correction giving us the correct door. 1. Text reads “heavy” referring to the door they leave by. 2. Light is the opposite of heavy. 3. Light (as in not heavy) is switched for light (vs dark). 4. Light is applied to the doors. 5. The lightest door is the correct door. 3. Right (as in correct) is switched for right (as in versus left). 4. “Not right” is applied to the doors. 5. The furthest right door is incorrect. These are creative, and creative is good. The observations here may produce fruit eventually but this approach can be used to confirm anything. Mole Man, I think you’re being a little unfair and making each of those solutions seem more convoluted than it is by stretching it out to five steps, without acknowledging that there’s only one really major leap in each of those solutions: reading “odd” for “strange”, substituting one meaning of “light” for another, and pulling “not right” out of “corrected”. Of these, I feel favorable toward the “light” wordplay, and don’t feel great about the other two. I concur with the ever level-headed Beelz on this one. I am going to add, however, without even bothering to get into specific examples, that it is not the case that words like “correct” or “right” or “left” or “sinister” inherently suggesting going either left or right. Changing “strange” to “odd,” and then reading a second meaning of odd, is a bit more of a step than just using “light” in two ways, though I suppose it is a similar principle. If you look at it as pushing open the lightest of the heavy doors, that’s not an unworkable solution…it’s not that you’re looking for a non-heavy door, but just the one of the heavy doors that they “managed” to open. Even that phrasing slightly implies they may have failed at opening other heavy doors…not much, though. I didn’t phrase that at all clearly. I just meant to say that when we see a word like “right” or “left” it doesn’t always mean we should go in the direction, nor does it always mean we go in the opposite direction. Something more is needed to make a usable clue. The least objectionable solution (“strange” > “odd” > odd numbered > reversed to even) is a stretch. If the text said “odd” (strange) and we took this to mean odd numbered this one step process would be straight forward. If the text said “odd” and the guide corrected “oddly” this two step process would be reasonable. But three steps allows a person to do just about anything with the text. Carl said it. I wasn’t trying to make it look more complicated or anything, just point out the logical problem of making multiple jumps like that. The tree has two holes forming an eight. And eight can be divided into four and four…door number 44. The text says that “…we managed to push open one of the heavy doors…”. This means it cannot be door 21 because it is already mostly open. When it says leaves began to gather at their feet, is that referring to the upright rake with the pile of leaves at its base? That rake points up at the tree branch that reaches for 44. “Dead”, “branches”, “look”, and “wind” are all repeated twice in the text. Repetitions indicating a repetition of 4, perhaps. Maybe “very” instead of branches? Reasoning is that a handful of repeated words is unexceptional. Exactly 4 4 letter words repeated twice in any other book would be coincidence but here probably means intentionality is my guess. Alas, ignoring everything but nouns, there are also two “doors.” Dang, that would have been cool. Also as mentioned I think. There are 10 sets of consecutive 4 letter words. Plus the bone tree. David, I was responding to Wanderer and your comment and my comment crossed each other. When I saw that you had posted before me I though you would realize I was not directing the comment toward you. Sorry for the confusion. The dark yin snake in 21 points here and the text opens with melancholy (a yin thing). With the wind blowing the hair away from the tree, I think even more of pestalence and black death. “death’ anyway for sure. This leads me to believe that 44 should have “rebirth”. We know the clock winds back up, etc… but maybe rebirth is there more explicitly somewhere. What is the v shaped thing under the faces? Id it is a ruffled collar then the face in 7 that is speared by the lamp could point to this room. An observation: The hair of all 4 faces blows away from the tree. Here is a bit of a something maybe. “old boards” seem to connect to room 2 and its “history” stuff. The text here also has “dead tree”, “white branches”, “grey clouds”, black is the missing member of that color-set. So think of the tree as black? Dead and black? Black death? Then with that history push, maybe it is a thing. But then it does not seem to do very much. Maybe the tree is “spreading” towards 44, with the bones on the ground, and the reaching claw? Another bit of something – “Walls to high to see over” probably means those bits over the door. They look like upside down baskets. But that does not get me much either. Add 19 + 21 + 2 Bones = 44 ? There are two sentances with a form of “to” twice. “too high to” see. And “managed to” and “way to”. 2+2,2+2 = 4,4 = 44. They pushed open a door, so they did not go to room 21. Oh, good, can’t believe we didn’t mention that yet. This room might reference Dante’s forest of suicides. The exit door can be found in a number of ways, so there should be something to please and displease everyone here. As mentioned on the here, the claw-like hand of the tree reaches for 44, and under magnification the eyes may look at door 44. We can note the false exit indicator of the broom pointing at 19 and the open door to 21, and by the “odd one in” principle we can choose 44. “Dead” is in the text twice indicating we should make use of it, and very present in the picture. It is a 4 letter word and has two “D”s, in first and last position and the alphanumerical value of “D” is 4, so that could give us a 44. There are an abnormally high number of consecutive 4 letter words in the text. “dead tree”, “with grey”, “look very”, “they said”, “they look”, “look very”, “they seem”, “wind made”, “push open”. And also “Bone tree”, which dominates the picture, is two 4 letter words. That gives us 10 examples in this short text. 4,4 (x10). The other 2 doors, 19 and 21 sum to 40, and there are 4 yard tools here, and 40+4=44. Clustered with the 2 baskets and the broom we have 1 bone. We have 4 B-words, and B is alphanumeric 2. 2+2=4 and 2+2=4 and we have 4,4. Finally we have the “uber-solution”: The rake points up at the hand-like branch. Together these two objects give us “claw”. The ‘baskets” and “bone” can give us a “body”. Now look at the broom, it crosses the tree and is visible through that hole. The tree has been “pierced” it seems. It seems this tree has been a victim of violent attack by something with claws, maybe in fact “rending it with claws” and oh hey, that is familiar (see text in 42). But what about those eyes? Well clearly they would have “witnessed” this crime. Ah…room 23, where we get all that business about witnessing a false bear and bearing false witness. Is there confirmation that we should be looking here? Yes. “Wind” is repeated in the text in 31 and again fits with room 23. OK so what about that room? We know the focus there was 8, the 8th commandment, etc. Now we note that there are 2 of a number of things, 2 violent tools, 2 baskets, two rends in the tree. All we need do now is rend that 8 in half and get two 4s, and we have our 44. This is not my favorite room puzzle, but clearly the intended one. I was skeptical at first of Hello Gregor’s pupil discovery, the way I confirmed it for myself was by scanning in the illustration and doubling the size of the image. In a case such as this it is helpful to remember that the original image was much larger than the book. To send me the images of the sequel that wasn’t produced Manson had to scan each image four times, one for each quadrant, and then I stitched them back together in Photoshop. From this I would surmise that the size of the original image was about 1 3/4 feet by 3 feet. I certainly hope that there are not many more riddles like this, hidden due to the reduced size of the book. The “View Related Images” link above has an image of the faces side by side doubled in size. It convinced me – you be the judge. I took pains to note that the bear in Room 2 probably couldn’t actually see anything on the wall over its head and behind it, but that it’s eyes still pointed toward images there. This would at best be the same thing; that face can’t actually view the door beside it by looking at that angle, but the pupils are directed somewhat toward the left side of the page. A problem that Manson would have here is that if he buried the pupils too far into the corners of the eyes, they’d become practically invisible, unless he made them bigger, but then they wouldn’t be tricky to spot. So he had to center them in enough white that they could be picked out. I don’t know whether they’re supposed to point at 44, but it doesn’t look very compelling to me. And they’re surely not looking at 44. Why do you, Vincent Watkins Esq., think the text highlights the way the faces are looking then if not to direct our attention to the direction they’re looking? Beelzebibble! I’ve read a lot of your comments on the site, but I wasn’t sure whether you were still around or what. Glad to see you here. Haha yep still watching, still scraping the bottom of the barrel for weak clues while you, Gregor, Dave, and the others smash the maze to pieces with your insights. I like the recent changes! White Raven’s summaries of confirmed clues at the top of each page are very helpful and of course the Like system is super fun. What do you make of that odd glowing blob just above the lower rightmost branch? Is that an embryo-fruit hanging from that dead branch? Most of the active users on the abyss are in communication outside the website as well. Do you have any interest in joining the Maze-related google hangout we’re all in? Participating in future podcasts? Meeting for dinner? As much or as little as you want to be involved, you’re welcome and invited. Yeah, so long as you keep the compliments coming heavy and thick. @vewatkin: Yeah, totally! I’ve never used Hangouts before, let me try to set it up and see what I have to do to get in touch with you guys. Send me an email, beelzebibble. It’s just vewatkin at gmail dot com. I’ll offer my trademarked incompetent technical support to get you into our hangout. Correct! Bumping it up one! Note: There’s another (sort of) part to this riddle which strengthens the connection. Could it be the relation between “push open” in the text and the fact that the “hand” seems to be making a pushing motion, specifically, toward door 44? Hmm, the wall is too high to see over…but not for Johnny Treebones! Old JT sees the way to go, and reaches out to 44 to tell you the deal. Good work, Johnny T.
Man, those pupils ain’t lookin at 44. You all be crazy. It looks like there’s something written in those tree branches, but damned if I can make anything out but an E or a Y here or there. I’d give someone a dollar to read it for me. Forty-four is the best answer. 1. 19 and 21 are pointed at by broom and bone-stick respectively. 2. 21 is already open. The visitors had to “..push open one of the heavy doors..” in order to proceed. 3. Door 19′s face has pupils that look to door 44. 4. The doormen each have four hairs, making each wall’s pair read 44. 5. The really tall broom leaning against the wall touches the meeting place of two fourth bricks. 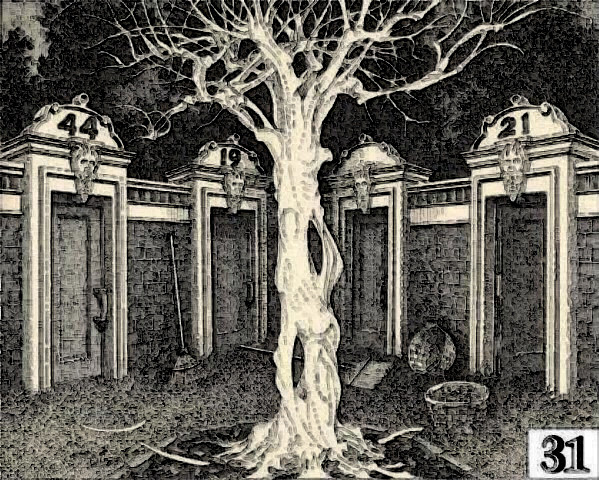 I studied the picture carefully – you are quite correct that the pupils of the face over door 19 are looking at door 44. At first I thought may just be an unintentional illusion but on close inspection each pupil is made of several lines – it was clearly intentional. I am modifying the Guide book and giving you credit for this discovery (though I don’t actually give solutions in the book). Congratulations! Bumping the solve meter up one! Let’s think more about this dead place..
1. There is quite a bit of text devoted to the eyes of the figures. Each wall has four eyes= 44. 2. Observation: Although the wall is “too high to see over”, the figures can each see over the wall adjoining their own. a. The introduction description which concerns itself with height and mood- first the imposing height of the walls and then the aspirational reach of the branches toward the gathering clouds. c. The effects of the wind and, perhaps, the rake followed by the exit. FYI: I found another part to the pupils riddle you discovered. The pupils were clearly intentional. Is it the “they look very strangely”? That’s what drew my attention to the eyes. Yep! I spent a lot of time trying to figure out what the difference was between “strange” and “strangely” then I found a riddle it appeared to relate to and moved on. Apparently I was too hasty. When the Guide turns “strange” into “strangely” he turns the object, the faces, into the subject…the looked at becomes the looker…looking strangely at door 44. Thank you for seeing the pupils, what an awesome riddle! This is the kind of thing I mean when I say we need to vocalize some of our simpler assumptions. I would guess many people here understood the strange/strangely comment as indicating the faces themselves as subjects, and took that to be implicit in Hello Gregor’s initial observations. We might end up puzzling about something completely depuzzled. You’re right. With puzzles like this, I think we all have our own tendencies which end up being areas we’re strong in or things we see right away. There can be a tendency to not explain those things because we might think other people also see them right away, but, then, others may have completely different things they right away. That’s one of the joys of doing this as a group. For example, I never naturally look for anagrams. A lot of times I read something and wonder, does this person understand the implications of what they are writing? Usually the answer turns out to be no, but there are a few comments out there that have near solutions that I am unsure of. Is the person writing the comment just fishing or do they know it could add up to the room number or whatever?